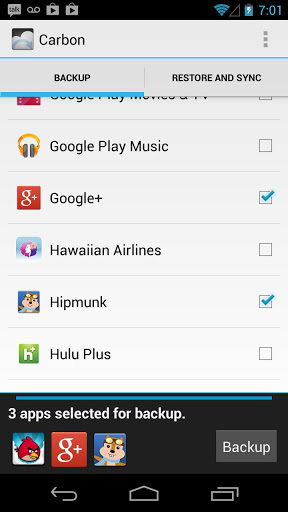 The Google play store contains some apps which are downright stupid and useless, some are popular and good and some are good but are not noticed. This article will explain some of the unusual and some popular but most productive apps for iPhone and Android. Swiftkey is like the original swype keyboard but improved a lot!, it auto learns what u write and its suggestions become accurate with time. It even displays how much time u have saved and how much u have ‘flowed’, quite a nifty feature. Greenify helps you to make apps sleep or force them to go into hibernation, this way they cannot leech system resources and battery. Apps in background take up alot of ram and cpu power, greenify helps u locate buggy apps and shut them down permanently or for a short period of time, in short words one of the most productive apps around. You may have heard of titanium backup and lets admit, titanium is quite tricky and it requires root access. Helium is all that titanum is and more. It backs up your applications/settings/data and accounts to other devices and it does all this without root access. Quite easy to understand from the name, ReadItToMe translated text into voice, quite an important tool for people who have poor eyesight. It even has a pro version which reads out more content like sms messages, app notifications and support for many languages. If a game is not meant to played on your android mobile, dont worry, because chainfire3d was made exactly for that purpose. It allows u to tinker with the graphical settings of certain games. In essence you can lower graphic settings to enable your mobile to run that particular game. With this app u can install ‘modules’ into your mobile which can enable a couple of features. For example Unicon which is a theme manager, works in tandem with Xposed installer. This allows u to control your ‘ROM’ without the need to flash a new one.